3D printers have been with us for decades, routinely turning 3D computer designs into detailed physical objects for product design, education, architecture, healthcare, mapping, historic preservation and other applications. These devices create models in a range of materials, including plastic, plaster, photopolymers, metal and sometimes even food. Each of these materials brings inherent advantages and disadvantages, depending upon your application. There’s one more to consider: paper. 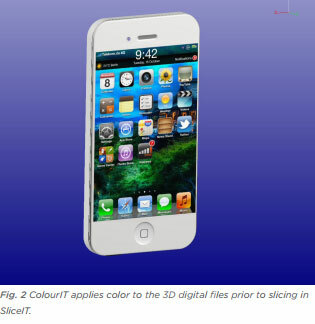 Selective Deposition Lamination (SDL) or paper 3D printing was invented by Dr. Conor and Fintan MacCormack in 2003. Dr. MacCormack first discovered 3D printing in 1986, when he was a secondary student in Ireland watching a BBC special. The technology captured his imagination in the same way that motorcycles, rockets, computers and space travel already had. He initially saw the technology in person when he was earning his doctorate degree at Trinity College. Unfortunately, the school’s 3D printer was only a tease: because of the high cost of the material, only one or two students could print a model at the end of the year, defeating the whole purpose of having the technology. When he started working with Airbus as an engineer, he had ample access to a 3D printer – access he knew most students and engineers were denied. It just wasn’t right. Although 3D printer prices were declining, the cost of their materials was soaring. So Dr. MacCormack and his older brother, Fintan, a qualified aircraft mechanic and electrical engineer, set out to invent a 3D printer with an operating cost so low that the technology would be accessible to everyone. It was also important to make the printer robust enough for serious use in commercial settings, yet easy to use and without the toxic chemicals on which so many 3D printers rely. That vision has become a reality in the company the MacCormacks co-founded, Mcor Technologies, which manufactures monochrome and full-color 3D printers that cost a fraction of any other 3D printing technology. The key reason? 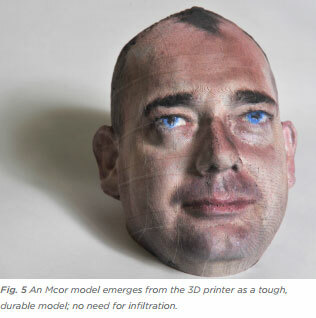 While most technologies build models from expensive plastic or chemically infused powder, Mcor 3D printers use ordinary, affordable and ubiquitous office paper as the build material. SDL is not to be confused with the old laminated object manufacturing (LOM) technology. LOM used a laser, laminated paper and glue, so everything was glued together, including the support material around the model. 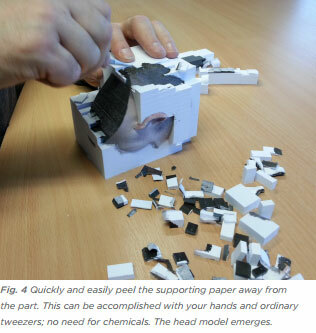 Excavating the model was an ordeal, often resulting in 3D part breakage. Mcor uses a blade for the cutting and the 3D printer selectively deposits the adhesive only where it’s needed. 3D printing starts with a 3D data file. Mcor 3D printers support the universal industry standard file format for 3D product designs, STL, as well as OBJ and VRML (for color 3D printing). 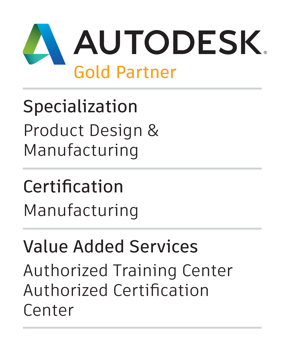 All mainstream 3D computer-aided design (CAD) software products, including free programs such as SketchUp, produce STL files. Completed designs offered for download are typically presented in STL, as are files produced by scanning a physical object. 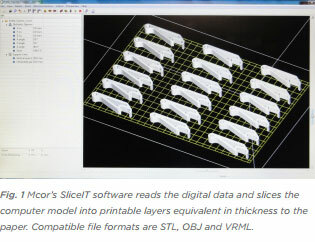 Mcor 3D printers include control software, called SliceIT. (Fig. 1) SliceIT reads the digital data and slices the computer model into printable layers equivalent in thickness to the paper. The software also enables you to position the part, or several parts, within the 3D printer’s build chamber. SliceIT works on any standard PC running 64bit Windows (2000, XP, Vista or Windows 7) with a dedicated Ethernet card (speed of 10/100 or better) connected directly to the 3D printer. The IRIS also comes with an additional piece of software, called ColourIT which is used in conjunction with SliceIT to apply color to the 3D digital files. (Fig. 2) ColourIT can open numerous file formats: STL, WRL, OBJ, 3DS, FBX, DAE and PLY. Once the file is within ColourIT it can be checked for integrity to ensure it’s a waterproof manifold, however the main function of ColourIT is to apply colors to the digital files prior to slicing in SliceIT. Once the color has been applied, the model is exported as an WRL file which is then imported into SliceIT for preparation for building. • Once the blade depth and the adhesive levels are correct, the doors are closed and the machine is ready to accept data from SliceIT. the 3D printer starts to make the part. The main benefit of the SDL process becomes evident when the removal of the waste occurs. This process is called “weeding.” Because the adhesive is applied selectively, there is a greater bond between the layers of paper which constitute the model and less bond between the layers making the support material. Also, to aid ease of weeding, the support material is “diced” so that small portions of support material can be removed to ensure that delicate 3D models survive. (Fig. 4). Unlike other technologies, Mcor 3D printers do not require dipping of parts in toxic chemicals or sharp instruments to remove support structures, vacuuming powder, or infiltration. An Mcor model will not crumble or shatter. It emerges from the 3D printer as a tough, durable model. (Fig. 5) When you consider that it’s made of tightly compressed sheets of paper, it essentially is reconstituted wood. As such, it generates a warm, tactile response that is uniquely pleasing to the touch. If you want to make parts that can be drilled, threaded, tapped or water resistant, you can give them a quick dip and they’re ready to go. The model will also accept a variety of optional common finishes to suit your application needs.